If you like a kick about or cheering your boys onto victory down the local pub, you’ll likely love Football Champions Cup. It’s got all the excitement of a great football tournament and a chance to win much more than you could just taking a punt on your team finishing up at three nil in the big match. Unfortunately, you might have to watch England get knocked out by way of penalties yet again! In terms of specifics, Football Champions Cup is played on a standard five by three grid. There are 20 win lines and a few innovative special features that fans of footy will love. Interesting take on bonus modes. The game’s features are relevant to the theme of football tournaments. It’s great when designers can combine the concept with some of the gameplay modes. High main game prizes. We love four figure payments and Football Champions Cup has two ways of winning such large jackpots in the base game alone. Limited appeal. If you don’t like football, you won’t like Football Champions Cup. The select a team option is utterly pointless. Gold “Wild” = 2,000x the line bet. Red = 1,000x the line bet. Pink = 750x the line bet. Green = 500x the line bet. Blue = 300x the line bet. Light Blue = 250x the line bet. This feature is triggered by landing three or more “bonus” symbols anywhere on the reels. 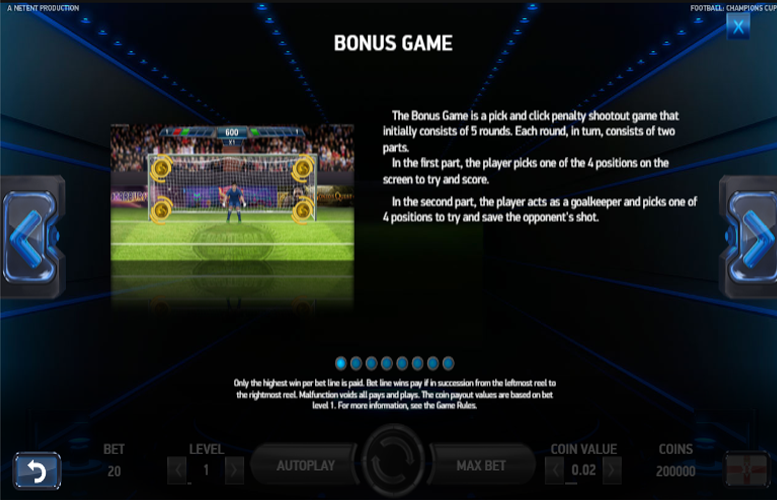 The bonus game on Football Champions Cup is a pick and click penalty shootout game that initially consists of five rounds. Each round, in turn, consists of two parts. In the first, the player picks one of the four positions of the screen to try and score. During the subsequent part, the player acts as a goalkeeper and picks one of the four positions to try and save the opponent’s shot. Three or more Cup “scatter” symbols landing on the reels two, three, or four will trigger this bonus. 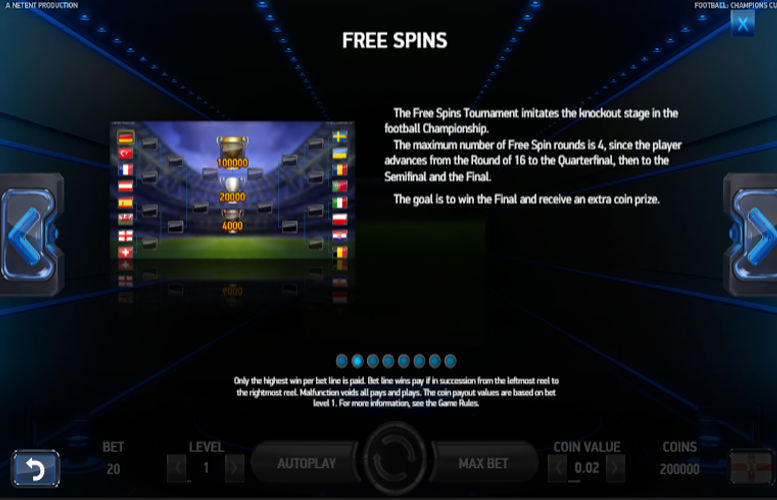 The Free Spins Tournament imitates the knockout stages in a football championship such as the world cup. The maximum number of free spin rounds is four (since the player advances from the Round of 16 to the Quarter-final, then onto the Semi-final, and the Final). Naturally, the goal is to win the Final and receive an extra coin prize. 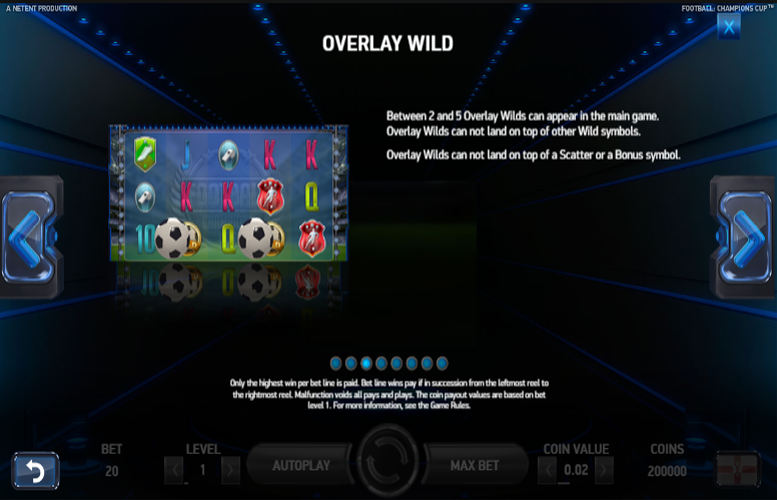 Between two and five overlay “wilds” can appears in the main game. They cannot land on top of other “wild” symbols. They also cannot land on top of “scatter” or “bonus” symbols. 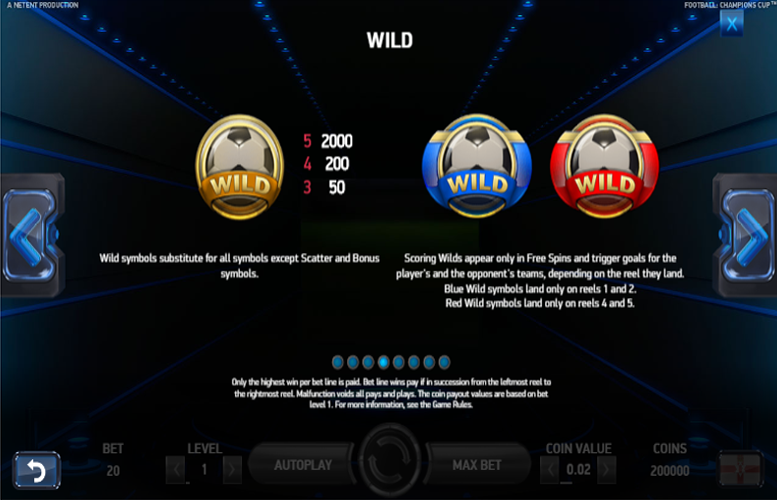 The Scoring “wild” symbols will only appear during Free Spins. They trigger goals from the player’s and the opponent’s teams depending on the reels they land on. Players should note blue “wild” symbols will only land on reels one and two. Meanwhile, red “wild” symbols will only land on reels four and five. King = 175x the line bet. Queen = 150x the line bet. Jack = 120x the line bet. Ten = 100x the line bet. In terms of betting limits on Football Champions Cup, players are able to adjust the number of coins they bet on each of the 20 win lines. They can also alter the value of each of these coins. Since the number of win lines is fixed at 20, there is no option to alter this. The minimum and maximum value of each coin is 1p and £1 respectively. Meanwhile, players can elect to wage between one and ten coins on each line. This means that with all values set to the minimum, the lowest possible bet per spin is just 20p. Meanwhile, with all variables maxed out, the largest bet on every spin is £200. This should be plenty for all but the very highest rollers around. 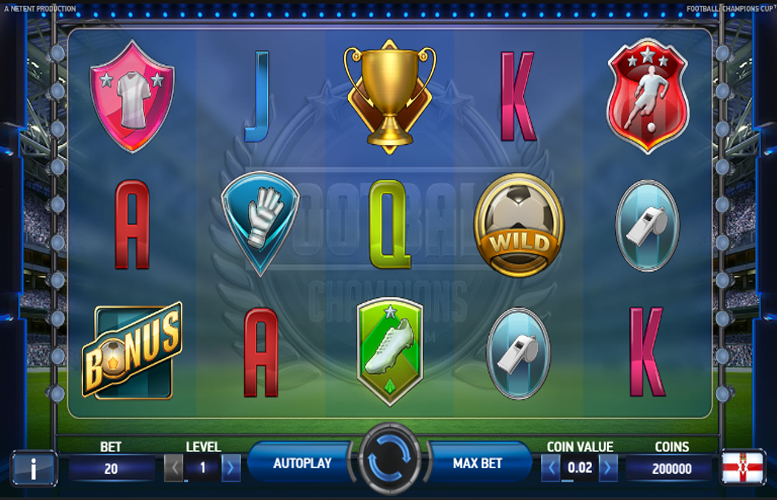 The Football Champions Cup slot machine from Netent will likely delight all those who love a punt, or the footy, or both. It offers a few dynamic gameplay modes and the authentic crowd noises combine with potentially massive pay-outs to give an atmosphere that’s almost as exciting as cheering your lads on in the world cup final. Naturally, if you don’t like football, you’ll probably want to give this one a miss. This game has a rating of 4 / 5 with 391 total reviews by the users.